Well equiped villa. Center, beaches walkable in front of the Golf "La Nivelle"
Quiet place,in front of the 8th hole of the golf,splendid villa with warmed pool. Great for family getaway. Well located. Although it rained and rained the week we were there this house is fabulous for a family - plenty of room to spread out with table tennis and a pool table. We didn't use the pool much but it was a good size and the heater would have worked great if not for torrential rainfall all night and most mornings!! The wifi was good, the washing machine and clothes dryer etc all good. Kitchen very well equipped with herbs, oil etc as well as lots of pots and pans etc. Pierre was a great host and explained how everything worked before he left us to it. Great location and we walked to local small shops for groceries and patisseries most days. We also found it easier to walk along the river into town for shopping and meals than to try to get a park in town. Would highly recommend this property for large groups or families. We loved our stay in this spacious, elegant, comfortable house. Six of us had a great family holiday here. Pierre welcomed us so well - met us at the airport and drove us to the house, then lent us a car to get groceries. Downstairs the house is amazing - lots of space, very quiet, well-equipped kitchen, music system, pool table (! ), lots of areas for sitting both inside and out, and a lovely big heated pool that we spent a lot of time in. The area is great too. The house is in a quiet neighbourhood next to a golf course, but a fifteen minute walk alongside the scenic river Nivelle brings you to the compact old town of St Jean de Luz, or to the train station (we went to San Sebastian and Hendaye from there). And there are shops and a bar a lot closer. Downsides - while the two downstairs bedrooms are quiet and roomy, the upstairs double is very cramped and only screened off the main living area by thin sliding doors, so has no sound-proofing at all. The fourth bedroom is more like a kid's dormitory with plastic covers on the mattresses, and finally, for six adults, we could have done with an extra bathroom/toilet. Otherwise, what a lovely place to spend some time in! We are happy to know that you spent a great holiday in Ciboure-Saint jean de Luz. Concerning the new range of cover matress,we changed them after reading you.We bought some in cotton as before.The feeling is a lot better. I have to precise that this bedroom is composed by 3 single beds with matresses for adults and not kids. When families use the vila,it is true that this bedroom is favorites with the kids. Thank you again and we hope you will come back to the villa for a new holiday. We travelled as a Family to relax and also seeing the area as we were all quite new there. We were amazed when we entered the house. Some pictures were accurate, some did not do the Property justice. You have got everything you possibly want. Entertainment if you have a pure day at the House i.e. Pool-Billiard, the Swimming pool, Table Tennis, a BBQ, a TV with international channels, board games, etc. And as if this is not enough there is the owner Pierre. Super friendly, always approachable and he is able to give excellent recommendations on things to do or to see in the greater area of the Bask region. You could not wish for a better Landlord. Everything was clean and well maintained. We even received welcome amenities, which was a very nice surprise. 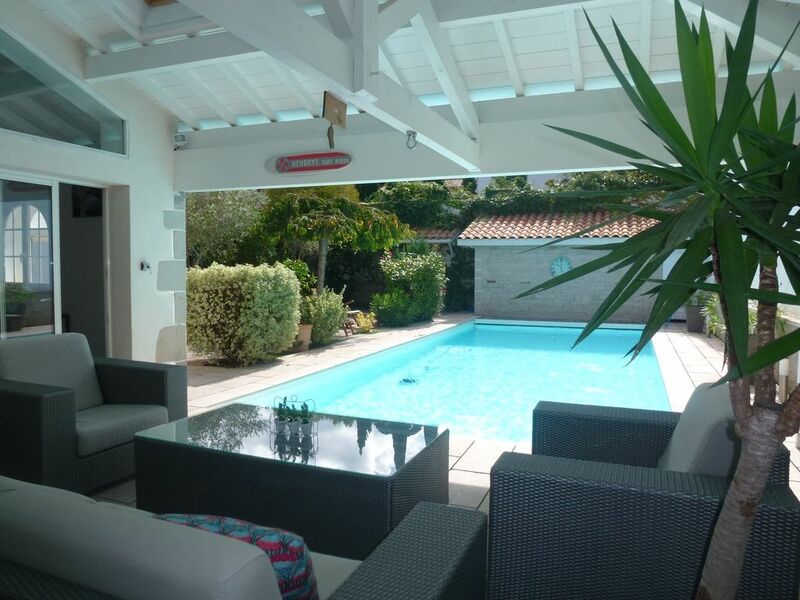 The house is located in Ciboure and it is a short walk to Saint-Jean-de-Luz, alternatively there are bikes available to cycle in there area. The Pool has a security cover that allows children to play near the pool if it is not in use. The rooms are as described in the advert, there are 2 double bedrooms and bunk beds downstairs (the latter are in open space and have no door) 1 Double Bedroom and a room with 3 single beds upstairs. Upstairs the ceiling is low on some parts due to the construction of the house, so that needs a couple of days getting used to and there is no real Wardrobe or hanging space upstairs, but therefore enough in one of the downstairs bedrooms. All in all, we can only recommend this property and the owner. We would be very happy to return. Merci John pour cette appréciation très complète. Nous avons eu beaucoup de plaisir à vous accueillir. Nous avons posté une photo de la nouvelle douche qui a remplacé celle qui était défaillante pendant votre séjour.Ces travaux ont pris du temps pour essayer d'obtenir une belle réalisation. Nous sommes ravis d'avoir fait votre connaissance et vous disons à bientôt. Lovely villa, very spacious and great location. There was 8 in our party and plenty of room. Pierre was fabulous with us. Picked us up from train station when we arrived and even took us to supermarket twice. He was a gentleman. Nothing was too much trouble. Would definitely go back. Julie,thank you very much for your post. Was happy to receive you and your family. Reception and instructions with regional maps about the different cultural places to visit.